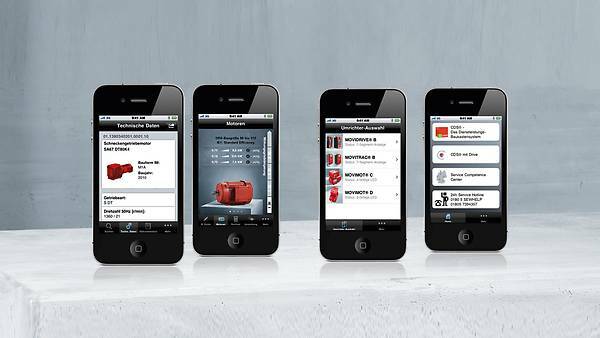 SEW-EURODRIVE on the go: Added value, energy efficiency and innovative communication technology combined – with the new iPhone apps from SEW‑EURODRIVE. We make you mobile: With the apps from SEW-EURODRIVE, you can conveniently access practical information and services from your smartphone. Whether you want to know more about current efficiency regulations, need help with error diagnostics or want to download technical data on your drive components. This app from our DriveBenefits process solutions provides important information on your product easily and quickly directly on your iPhone/smartphone – at any time and any location. We also support you in case of malfunctions of your product. Just enter the serial number printed on the nameplate or scan the QR code from the DriveTag label on your product. New: guided error analysis for your product, direct contact to our Service, and much more. This feature is country-specific. This app from our DriveBenefits process solutions helps you quickly and easily diagnose errors in drive inverters. By entering the error code, you receive an overview of possible causes as well as the right solutions.